Who's got the best Book then? 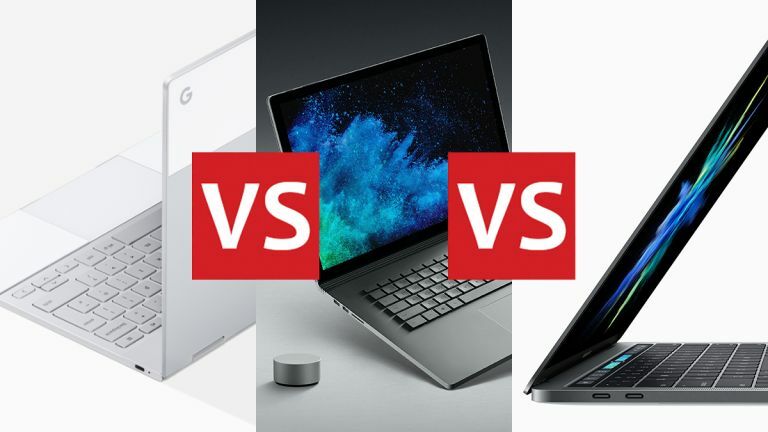 With Google rebooting its own-brand Chromebook line, and Microsoft showing an increasing interest in making its own hardware over the last couple of years, we've got a situation where Google, Microsoft and Apple all have flagship laptops on the market. So which one of these high-end machines is going to be the right pick for you? Here we'll guide you through the latest specs and prices for these devices - focusing on the most recent models - so you can come to an informed decision about your next computer. Processor power and screen size might grab a lot of the attention when it comes to weighing up laptops, but the on-board software is going to make just as much of a difference to your computing experience. You may have already settled on one of these operating systems for life, but each one has its own pros and cons. Chrome OS on the Pixelbook (above) is essentially just Chrome - that means you can't install desktop apps or do much offline, but it also means the system is lightweight, secure, and unlikely to slow down over time. Note that many Chromebooks, including the Pixelbook, can now run Android apps as well, giving you access to the likes of Instagram, Netflix (complete with offline downloads), Spotify, and all those other apps you use every day on your phone. We don't have space for a full Windows 10 vs macOS High Sierra head-to-head here, but you're probably familiar with the arguments by now. Apple's OS is slick and powerful, and comes with a ton of included (Apple) software, while Microsoft's OS is just as impressive in the performance and features stakes, and a better choice for gamers or those working with non-Apple hardware. The Google Pixelbook comes in one size, with a 12.3-inch, 2,400 x 1,600 pixel screen (235 ppi). Under the hood you can have either an i5 or i7 processor, together with 8GB or 16GB of RAM. In terms of on-board storage, meanwhile, your choices are a 128GB, 256GB or 512GB solid state drive. Microsoft's very latest Surface Book - the Surface Book 2 (above) - gives you a choice of a 13.5-inch or a 15-inch screen, both with resolutions of 3,000 x 2,000 pixels (267 ppi or 240 ppi). Again you've got a choice of i5 or i7 processors as well as 8GB or 16GB of RAM, but in this case the on-board storage choices are 256GB, 512GB or a whole 1TB. Finally, Apple's newest MacBook Pro (a selected number of older models are still on sale) comes with either a 13.3-inch, 2,560 x 1,600 (227 ppi) screen, or a 15.4-inch, 2,880 x 1,800 (220 ppi) screen. Intel's i5 and i7 CPUs are again on offer, with the other choices 8GB or 16GB of RAM, and 128GB, 256GB, 512GB, 1TB or 2TB of SSD storage. With each of these laptops you've got a choice of configurations to try and get your head around - even the Pixelbook has three options to pick from. Prices for Google's laptop start at £999/$999 and go up to £1,699/$1,649. A Pixelbook Pen stylus can be yours for £99/$99. For the Surface Book 2, your price range is £1,499/$1,499 up to an eye-watering $3,299 in the US, with the top-end UK pricing to be confirmed but likely to be similar in terms of a direct dollars-to-pounds conversation. If you want a Surface Pen as well to scribble on screen, that's an extra £99.99 or $99.99. As for the MacBook Pro (above), your buying options straight from Apple go from £1,249/$1,299 for the cheapest 13.3-inch model up to £3,969/$4,199 for the most expensive 15.4-inch model (that 2TB of SSD storage is really, really pricey), stopping at a lot of points in between. The Touch Bar is optional on the 13.3-inch model. In other words, you're going to be paying a lot for any of these laptops, and if you've got money to burn you can really trick them out. With so many configurations and prices to pick from, it's hard to do an overall comparison, but whatever models you're looking at, you're guaranteed to get a lot of power. All three of these laptops will zip through whatever tasks you give them. All three feature bright, crisp screens, though if you want a bigger, 15-inch model your choices are restricted to Microsoft or Apple. If you want the 2-in-1 tablet transforming option, meanwhile, or want to use a stylus, then you have to go for hardware from either Google or Microsoft. The MacBook Pro doesn't have a touchscreen, but it does have a Touch Bar, which works with an increasing number of apps. With the specs and pricing quite similar, you're back to what we mentioned at the start - your choice of OS. Chrome OS is lightweight and fast but will only suit a particular kind of user, while your preference for Microsoft or Apple hardware may well come down to the other devices you're using and the devices you've used in the past. The good news is there's a high-powered, sleek-looking laptop out there for everyone, whether you prefer Google's mix of Chrome and Android, the desktop-and-tablet hybrid that is Microsoft's Windows 10, or the aesthetics and power of Apple's hardware and software.